Do you or does someone you love have scoliosis? Have you struggled to find a treatment method that you feel good about and that has a good chance of relieving pain and keeping the patient out of surgery? 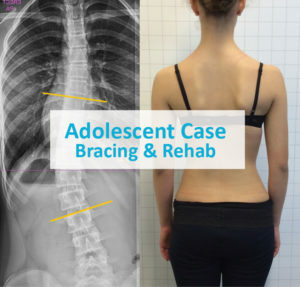 At Denver South, we treat many cases of adult scoliosis and scoliosis in children with the ScoliBrace. The ScoliBrace uses 3D laser technology to scan your entire body, not just your spine. That’s because scoliosis is a three-dimensional disease, not one that just exists on one plane. We combine that with photos of your spine and X-rays to design a brace that is unique to you. Each brace is special because each case of scoliosis is unique. The ScoliBrace is a scoliosis treatment that can help in several ways. It may reduce curves in certain types of scoliosis cases. You can talk to your doctor about whether your case fits within those categories. Scoliosis can hurt, and this brace and reduce pain in adult scoliosis and juvenile scoliosis. It can also improve posture, which can keep other areas of the body from being under- or over-developed, based on the particulars of your case of scoliosis. A ScoliBrace may also help improve the way you look Many people who suffer from scoliosis, especially kids, are self-conscious because the condition makes their waist asymmetrical, humps a rib, or throws their shoulders out of level. The ScoliBrace can make all of this better. provider. We will meet with you and assess your case of scoliosis. This may involve taking new X-rays, doing a physical examination, and more. Once we are sure that a ScoliBrace is the right scoliosis treatment for you, we will help you get a 3D scan done and we will send away for your brace. When ScoliBrace has all of your information, they will use their specially-designed computer system to make your brace. As soon as they can, they will send it to you. When your brace comes it, it’s time to get it fitted. You may have elastic pieces, velcro closures, or other types of toggles and fittings. Your doctors at Denver South will help you put the brace on and use these to tighten it appropriately for your back. They will also tell you how often you need to wear your brace when to take it off, and how long you can take it off for. They may also make sure that you know how to wear your brace and can get it off and on by yourself. We want to help you find the very best treatment for your scoliosis. If you’re not sure where to go next, give us a call. We will evaluate you and let you know if ScoliBrace is right for you. If it’s not, we have other scoliosis treatments we can try, too.